Anji Play Date: the first one! 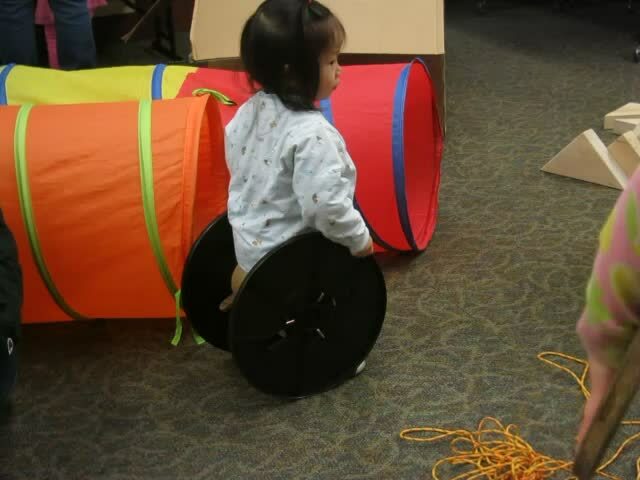 Indoor, self-determined play is surprisingly engaging! Today was the first day of the new AnjiPlayDate program. This is the same program I did a trial run of in December under the name Winter Wild Rumpus, but I thought I'd try this new name since more people around town seem to have heard of Anji Play now. Interestingly, most of the people who attended today did NOT come to the Winter Wild Rumpuses and (also interestingly) the ages seemed to skew a little older than the kids who had attended the Winter Wild Rumpuses. Granted, both of those facts may be due to the terrible "wintry mix" weather we were experiencing today, but I'll be curious to see who attends next week! 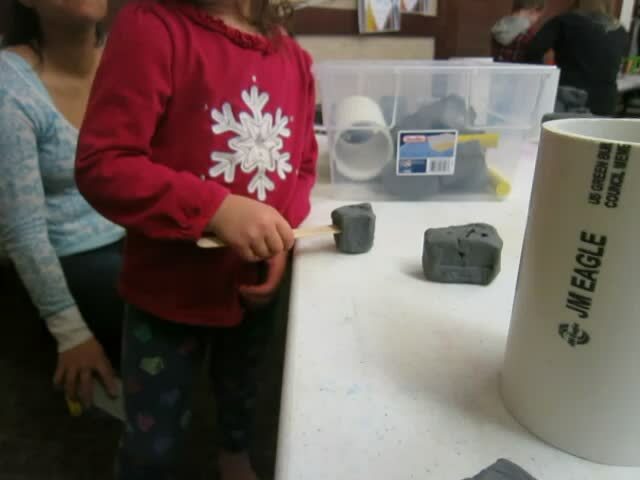 The one "big" change I made to the set-up was that instead of putting out rocks + water, I put out clay (plastilina) with some smaller wooden blocks (cylinders, triangles and wedges), some PVC pipes (short, 3" diameter) and some popsicle sticks. The clay was very firm and not easy to work with, but the kids seemed to really love the challenge working with it (this is a form of "heavy work" and is awesome for kids' development, both physical and emotional). 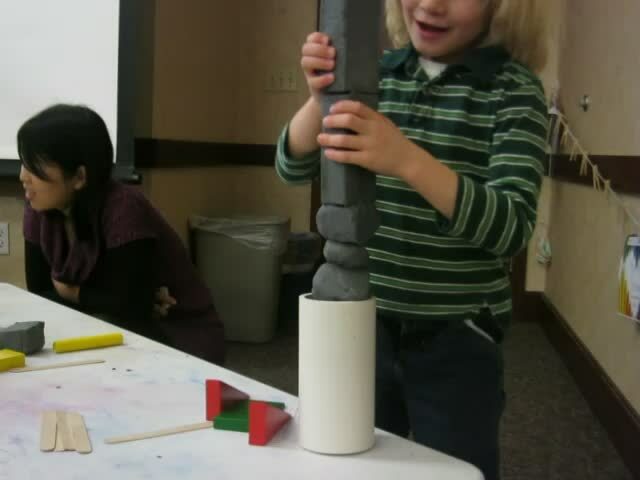 This young person was using his popsicle sticks like tweezers to pinch pieces of clay off the block. This player made a hammer and was rhythmically whacking the table over and over. Stacks were satisfying to build because they blocks of clay were so heavy but they were also slightly lopsided and also a little bit sticky, all of which lead to interesting stacking potential. I think this was supposed to be a dumbbell? And I'm loving the board-across-two-spools action going on here! Many parents were impressed that their kids were fully engaged for the full length of the program and many stayed through until the end. One more minor change I made (from the Winter Wild Rumpus) was that instead of the single page for play stories, I brought back the mini-notebook format from the summer's Wild Rumpus program. Each kid who comes in writes their name on the front of a notebook, then hangs the notebook on a clothesline along one of the walls. At the end of class, they found their notebook and drew their "play story" or a picture of their play that day.